As the undisputed belle of the season, Sarah has enchanted plenty of suitors. Still, she isn't interested in marriage, especially not to the pompous bore her father has chosen for her. But her hasty escape seems reckless now that she's estranged from her family and has no one to count on besides Christian. Turning the luckless lord into a catch has another unplanned consequence for Sarah: Has he run away with her heart? As with the earlier books in her Playful Brides series, Valerie Bowman once again has created an enjoyable, feel-good story with engaging characters, witty banter, heartfelt emotion, playful humor and a sigh-worthy happy ending. Sarah and Christian first meet when he discovers her in his Scotland hunting cottage. She's run from an unwanted betrothal engineered by her father and ends up snowbound with Christian. He quickly realizes that Sarah is unlike any other society miss he's met (she cooks, knits, is kind, and not the least bit spoiled or entitled). Also, as the belle of the current season, she's the perfect person to help transform him into a man who will be able to attract a bride. He hasn't had much luck on his own. He always seems to end up the best friend, never the lover. By the time the weather improves enough for them to leave the cottage, a few things have happened. Sarah has taught Christian how to make himself more attractive to society ladies, they have become friends, and Sarah is having second thoughts about disobeying her parents. With the assistance of Christian's influential friends, the two go their separate ways and Sarah is returned to London without damage to her reputation yet neither of them can't quite forget the other. When Christian finally returns to London, Sarah is still betrothed to a man she can't bear to be near (the thought of him touching her keeps her on the verge of a panic attack) yet she doesn't have the courage to defy society and her parents a second time. The more Christian and Sarah are together, the more their feelings deepen but he can't bring himself to be vulnerable enough to tell her how he really feels about her and she can't see any way out of marrying the man chosen by her parents. Will they ever find a way to be together? I love the slow build of this story and how Sarah and Christian become friends first before acknowledging the growing romantic feelings they have for one another. The secondary cast is a delight, especially the heroines from previous Playful Brides books who are determined to see their dear friend, Christian finally find his happy ending. There's also Sarah's brother who I do hope we'll be seeing more of in a future book. 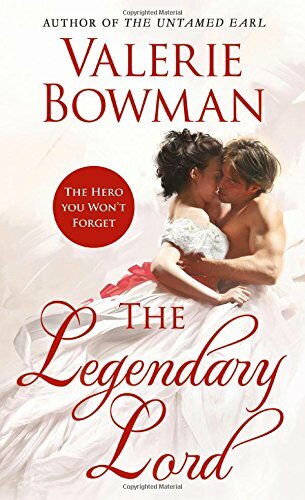 The Legendary Lord is the sixth book in Bowman's Playful Brides series but can easily be read as a standalone. However, by the time you finish, you'll probably be so captivated by the heroes and heroines from previous books who have prominent roles in Christian and Sarah's story that you'll want to download their books immediately. Are you reading Valerie Bowman's Playful Brides series? Do you have a favorite Playful Brides book? Do you enjoy snowbound romances as much as I do? Two randomly chosen people leaving comments will each receive a print copy of The Legendary Lord. (US only) Deadline to enter giveaway is 11:00 pm, November 8, 2016. Christian contemplated the young lady sitting across from him. He’d never considered such aspects of an arranged marriage before. Most of the ladies he knew, like his friends the Duchess of Claringdon, the Countess of Swifdon, and Mrs. Upton, had all chosen their husbands, fallen in love with them, actually. It had to be difficult to be a female forced to marry in accordance with her family’s wishes. It was done all the time, of course, this wasn’t an extraordinary circumstance, but Lady Sarah obviously had chosen to flee rather than obey. At great potential risk to her reputation. He could well imagine how her imperious father would react. The Earl of Highfield was a good man but could be pompous when the occasion arose. “You don’t feel fortunate?” Christian took another bite of stew. “Leave?” Christian narrowed his eyes on her. “No.” She groaned again. “That’s what is even more mad. The wedding isn’t to be until spring. But I just had to go. Oh, I know I sound positively insane. It’s quite difficult to explain.” She shook her head sadly and pushed her stew around in her bowl with her spoon. Copyright © 2016 by Valerie Bowman and reprinted by permission of St. Martin’s Paperbacks. Thanks for introducing me to this wonderful book and new author whose novels I would enjoy greatly. Valerie's books would be captivating and lovely. Many thanks. I have been collecting the series on my shelf & hope to read them all in order in the near future. I love the snowbound theme! Thanks for the review! I've read a lot of Valerie's books, and enjoyed every single one of them. I particularly enjoyed The Untamed Earl. It just goes to show that what you wish for can sometimes come true. Thank you for the chance to win. I've got a couple of Valerie's books, but I have some catching up to do! looove that cover :) this sounds fabulous! Now that the weather has changed, I do enjoy a snow/Christmas/Winter themed book. I haven't read this author yet, but I'm definitely interested now! THanks for sharing! I have not yet been able to read any of the books in this series. After reading the excerpt, I will have to remedy that. I enjoy both being snowed in and reading stories where the characters are snowed in. It creates a close, intimate atmosphere and tends to keep others from intruding. I am a huge fan of Valerie Bowman and thoroughly enjoyed "The Legendary Lord." She always "seasons" her novels with some humor too. If you haven't tried her novels, grab them and get caught up. She's a keeper. I love Valerie's books! Every one has been a treat to read! And yes, a love a great snowbound romance! Right now, I'm in the process of collecting all of the the books in the Playful Brides series. I usually try to get all the books in a series before I start reading. I currently have the first 5 books and waiting for release of The Legendary Lord. But now I realize Valerie has planned 10 books in this series. Me thinks I should get busy and start reading now! Valerie is a talented author. I've read other books and have loved each and every story I've picked up. Valerie is a new author for me. Loved the excerpt and want to read her books. Yes, I enjoy snowbound romances. I've not read this but I have enjoyed her books. Sounds good! I love Valerie's books. I read a netgalley of this book and really enjoyed the characters in it. I have enjoyed Valerie's books in the past. I haven't read The Playful Brides series yet.